High-density, structural resin construction with rounded corners holds up to 500 lb. 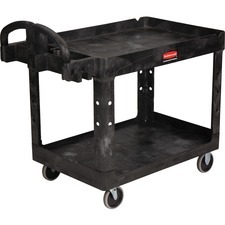 Two-tiered utility cart offers high-density, structural resin construction with rounded corners. Grip-height handle improves control and worker safety. Deep-pocketed top shelf keeps contents in place. Design also includes molded-in storage compartments, holsters, hooks and notches. Bottom shelf is also lipped to secure contents. Weight capacity is 500 lb. Cart is ideal for transporting materials, supplies and heavy loads. It is equipped with four 5" nonmarking rubber casters, including two that swivel. TPR casters absorb shock and provide floor surface protection and quiet operation. Casters roll easily on linoleum, tile, terrazzo, wood, smooth concrete and carpet.